Do you need your carpet patched? Call us, we make it simple for you! video to the side or below. Do you have the donor carpet to do the patch with? If ‘Yes’…life is good, call us. If ‘No’ can we take the carpet from a closet to use for the patch? If ‘Yes’? Life is good again, call us. ‘No’? We are so sorry but you need to supply the donor carpet for us to work with. 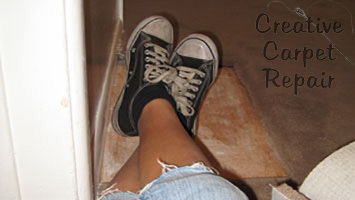 Do you have more carpet patching questions? 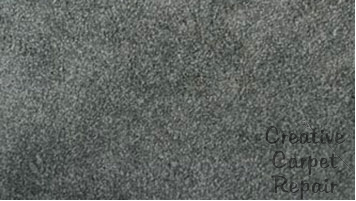 Please watch this short carpet patching video before you call. 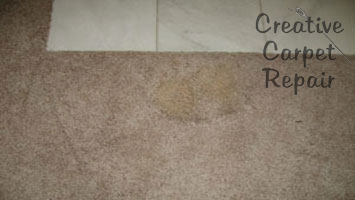 Do you have stains, rips, or tears in your carpet? 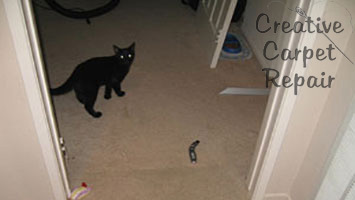 Did your dog or cat get locked in a room and try to claw its way out? 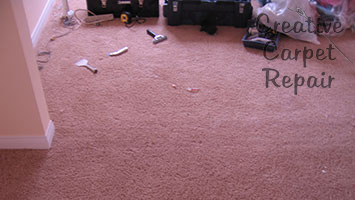 Often, when we repair a carpet by installing a carpet patch, it’s invisible. Other times you can see the patch from across the room. There are several main reasons that a patch may be visible. 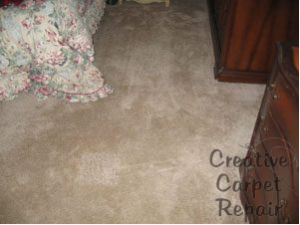 • Your carpet is faded while the donor carpet is not. This will create an obvious color difference. • Your carpet is worn while the donor carpet is now. The difference in wear pattern may or may not be obvious. • Seams that run across the row show more than seams that run will the row. If a portion of your carpet has been damaged by a pet, burned, or suffered some other catastrophe, patching the affected area can save you a fortune when compared to replacement. 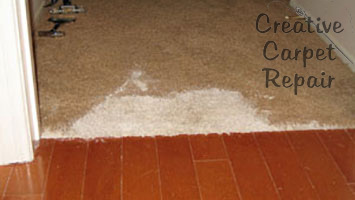 Successful carpet patching requires that you have a spare piece of carpet large enough to replace the damaged area. You may have carpet left over from installation, or perhaps we can pillage a piece from a closet or underneath a piece of furniture. 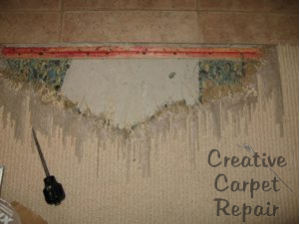 Berber carpet repair is a specialty within a specialty, and it’s definitely one of our specialties. 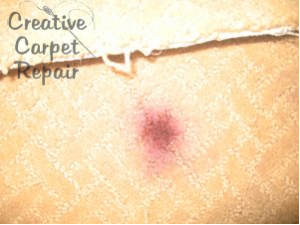 Our Berber carpet repair experts can fix runs and seams, perform patches, and stretch Berber carpet to eliminate wrinkles and bulges. 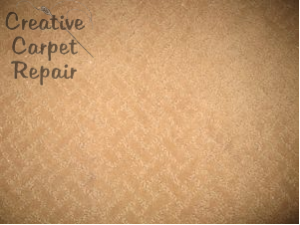 Berber carpet repair required experience and finesse, especially when seams run perpendicular to the carpet’s grain. 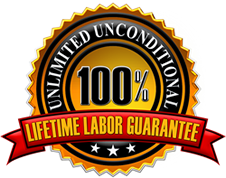 At Creative Carpet Repair, our carpet patching experts and Berber carpet repair specialists offer a 100% Unlimited Unconditional Lifetime Labor Guarantee on all of the jobs they do. 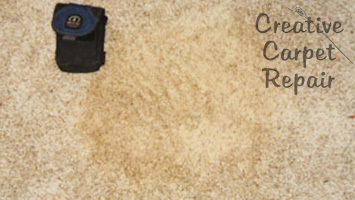 For more than a decade, Creative Carpet Repair has been helping both commercial and residential customers by providing quality carpet care at a fair price. You never have to worry about your investment because every job is backed up by our 100% labor guarantee – forever. Sometimes people call us to patch a carpet because they’ve removed a wall. In this case it was a wet-bar that was removed. This customer was concerned about seeing the patch in her carpet, then she saved thousands of dollars by patching her carpet instead of replacing it. All things considered it was a wise choice for her at the time. The first thing we do is to remove the tack strip from the concrete. You can see Alan removing the tack strip using a hammer and a pry-bar. It’s not all that easy to remove tack strip from concrete. 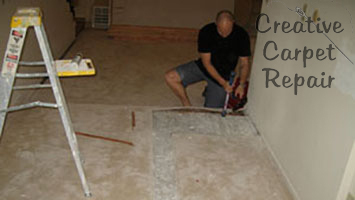 Concrete can chip while removing tack strip. When the concrete chips it can be like a little bullet. Alan should have been wearing eye protection. My bad. After the tack strip is removed we can cut the carpet so that it has great straight edges for us to install the carpet patch. The learning curve is quite steep when it comes to cutting both the receiving carpet and the donor carpet just perfectly. The next thing we need to do is to access the padding situation. When we patch in new padding it needs to be the same thickness and density as the rest of the carpet pad in the room or else the customer will feel the difference. After all the carpet is cut perfectly straight with the straight edge and the padding is installed properly, we begin the process of patching the carpet. This carpet patch is very close to a stair so it’s a little more challenging. No worries, Alan’s got this one! The carpet has been patched and vacuumed. If you didn’t know it was there you would never see it. This carpet patch took us about an hour to perform but that’s not the important thing. The important thing is that it looks great and we back up our work forever with our guarantee. This stain is actually a bleached area on the carpet. 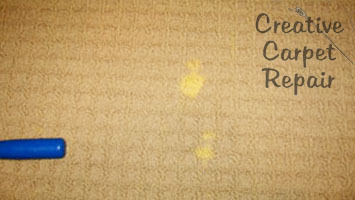 In this case instead of the bleach cleaning he carpet, it created a stain that can only be fixed by patching. The Patch Master makes patching a carpet look simple and it is. 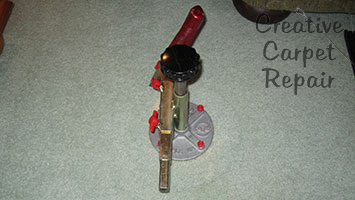 This tool is adjustable from just a few inches up to several feet. Here is a picture of a perfect circle path cut out of the carpet. I will use the same tool set at the same size to cut a perfect replacement. 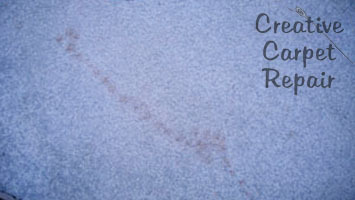 Here is a picture of a perfect circle path cut out of the stained carpet we were asked to repair. Now its just the matter of using the Patch Master tool to cut out an exact size circle to replace the stained piece we just pulled off. 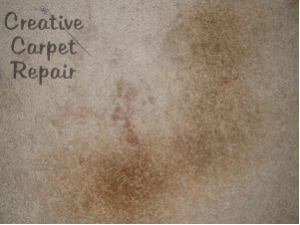 As you will see in the next image, repairing a stained carpet is not a simple matter and results will vary from job to job. The new patch is in place. You can see one of the problems with patching a carpet. The patched carpet is perfect but the carpet I replaced it with came from a scrap leftover from the original carpet installation. The scrap was kept in the dark so it didn’t fade like the rest of the carpet. Hopefully in time the patch will fade out a bit to match the color of the rest of the carpet. Either way it still looks far better than the bleach stain in the carpet. This cat was all over us when we were fixing the carpet that she ruined. She wouldn’t leave us alone. Cat’s damage a lot of carpet, especially when they get locked into a room and try to scratch and dig their way out. Luckily the customer had some extra carpet and were were able to patch it in. After cutting the carpet straight I removed the tack strip from where it didn’t need to be and installed the tack strip where it did need to be. Then I added new padding and a patch of carpet. In this picture you can see the carpet seam iron, the carpet tractor and the napping shears. Often times we can patch carpet so that you would never know that a carpet patch was even there. Removing a wall between two rooms leaves a gap where the wall used to be. These patches are far trickier than they look. The tack strip is removed and the carpet is cut straight and the padding added. I wish the lighting was a little better in these two carpet repair pictures but you can see that the carpet patch looks beautiful. 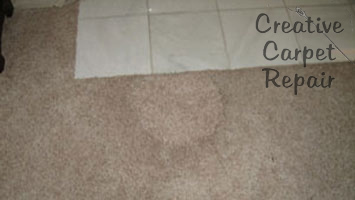 This carpet patch was a huge money saving idea for the customer. This is a brand new carpet with a nasty stain on it. It’s right in a high traffic area so this carpet patch will have to be installed flawlessly. I used the Patch Master for this patch to assure that the cutting of the carpet patch is done just right. After the patch is laid into place I use the carpet glue gun to finish the job. And people wonder why landlords don’t want to rent to people with dogs! I took off the door, replaced the carpet pad and installed a carpet patch. Before I patched the carpet the customer was thinking that he had to replace the entire room full of carpet. This carpet patch in saved the customer several hundred dollars. Paint in the carpet can sometimes be removed by a good carpet cleaner but this was just too much. The customer was a young bride who wanted to surprise her husband by painting the kitchen all by herself. She answered the front door in tears, poor thing. Surprise! She called me to see what I could do. I patched the carpet so perfectly that you can’t even see it at all. I don’t know if she ever did tell her husband. This carpet repair was my pleasure. 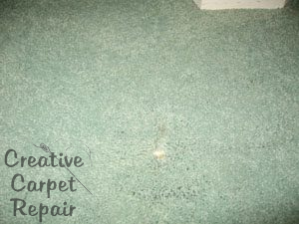 This carpet damage is worse than you can see from this picture. The carpet had delaminated. That means that the top of the carpet had separated for the backing of the carpet. Rather than fixing the damaged carpet I decided to put in a nice new carpet patch. Kitty! Small carpet patches like this aren’t a big deal for me to fix but if this carpet was left unfixed it would be a huge problem for the customer. Can you see the carpet patch? If you look close enough you can just barely make it out. This carpet patch was for a landlord. 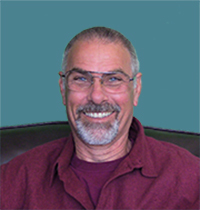 I received a call from a man in Agoura Hills, CA. He had a bad stain due to leaving a large potted plant on the carpet without protection. He did have some extra carpet left over from the carpet installation. Here’s the after picture. 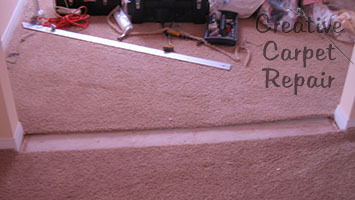 I patched the carpet using a special tool made especially for patching carpet. 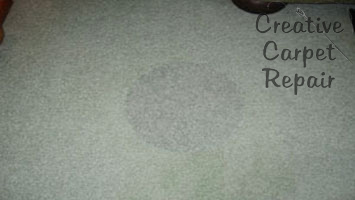 Carpet patches such as this are invisible and cost effective. Carpet repair in front of a trundle bed. 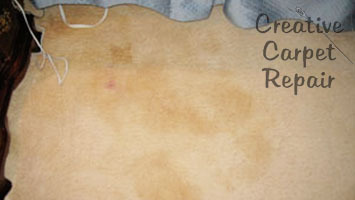 Carpet pet stains are not only ugly but they may have a bad smell too. 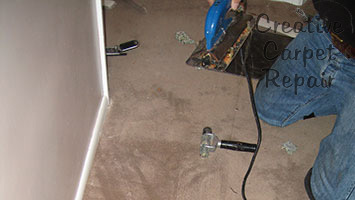 When we repaired this carpet we started by removing the pet stained carpet and soiled carpet padding. After the carpet and pad were removed, we cleaned the concrete floor with a special enzymatic type cleaner. 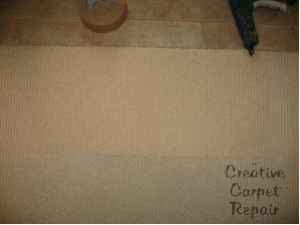 Then the carpet padding was replaced, we patched in a new piece of carpet pad and patched in a new patch of carpet. This carpet was stained bad enough that a normal carpet cleaning couldn’t remove the stain. We installed the carpet patch with a scrap of carpet left over from the carpet installation. The carpet around the patch is faded so you can see the patch, however, it looks far better than it did and it will blend in better with time. Patterned carpet patch. The cleaning people dripped some bleach on this carpet. When a carpet has a pattern it becomes more challenging to match it just right with a carpet patch. We need to take out time and have patience. It’ll be worth it when the carpet patch looks perfect. The patch in this carpet is perfect. You can’t see it at all. You can see Alan’s shadow as he takes the picture.. Here you can see that some bleach was dripped on the carpet. 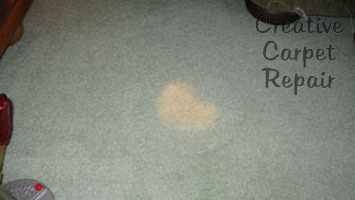 Carpet cleaning won’t do anything to resolve a bleach stain so we did some small carpet patches. Here you can see what happens to a carpet when a dog gets crazy with it. 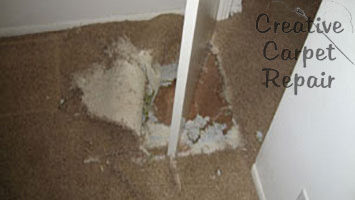 Pet damaged carpet repair is the same as any carpet repair. 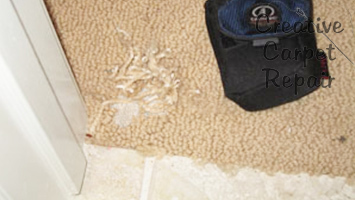 First we remove the ripped carpet and carpet pad, then we replace the carpet pad. 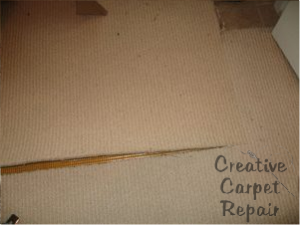 After the carpet pad has been replaced we use a carpet remnant or a piece of carpet from a closet to begin the carpet patch. Here you can see the carpet seam begin to take shape. 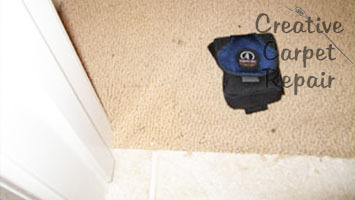 The carpet patch is complete when the carpet is tucked in between the tile and the carpet tack strip, the carpet is stretched tight so there are no carpet ripples, and the mess is cleaned up. You can clearly see where we put the patch due to the new donor carpet being clean and the older carpet being dirty. This is unavoidable. DOH! Red pen on the carpet! This carpet patch needed to be matched to the pattern in the carpet. When the pattern of the carpet is this small it sometimes takes more than one try to match the pattern. 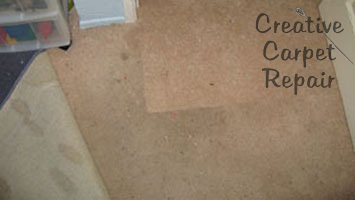 You can see from the photo below that the carpet patch did match by the time we finished. 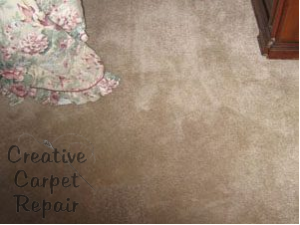 Carpet repairs are our specialty. 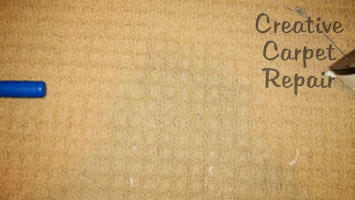 We not only make invisible carpet patches much of the time but it’s also quick and affordable. Bad dog! What have you done to this carpet!??!! There’s only one thing that will solve this carpet problem: A patch. We will not only install a new carpet patch but we will also need to install new carpet pad under it and clean the concrete below that. 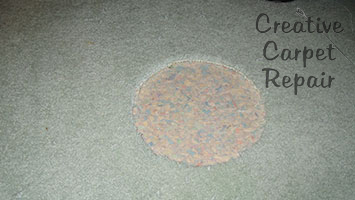 This carpet patch is not only invisible but it’s also stink-free! In this case we were called to patch carpet where there was once a heater vent. 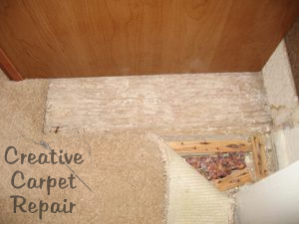 In order to install the carpet patch we will need to first remove the carpet tack strip, then patch the carpet pad and finally install carpet patch. The carpet patch is in and you would never know it’s there. 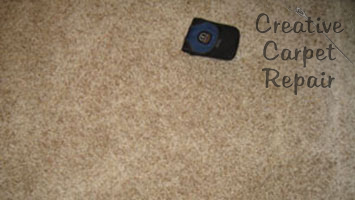 Anytime you need to have a carpet repair, call us! These two stains were from a dog. Actually, the dog’s part of it wasn’t so bad, it was the cleaning lady that bleached the carpet when she used the wrong cleaner to remove the dog urine. She should have used some soap and water or a special product that can be found at most pet stores. The customer was a very old man in a mobile home. 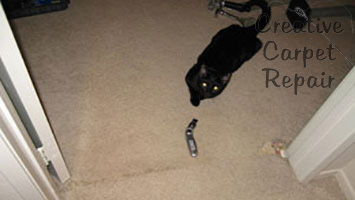 If you look close, you can see where I did the carpet repair. Often times this low end carpet falls apart around the edge when cutting it. Because of that I needed to seal all the edges. I was called out on this job to re-do a different carpet patch. The customer was tired of looking at the poor quality work and wondered if I could do better. The patch wasn’t really so bad except for a couple of small adjustments. There was also a small stain that the patch didn’t cover. Even a small stain can be seen from across the room. After repairing the old carpet patch, I put in an additional one. This customer was thrilled because he couldn’t see any of the carpet patches anymore. 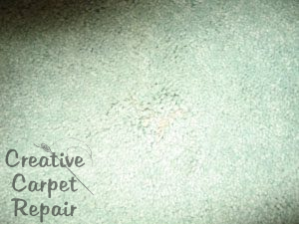 Carpet patching can be an art as well as a science. 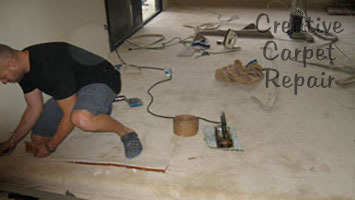 At Creative Carpet Repair it’s the most common carpet repair that customers call us for. 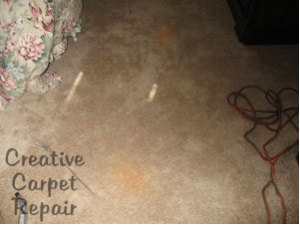 People also call us to patch their carpet because of, carpet stains, carpet tears, carpet burns (not the good kind), and remodeling as well as worn traffic paths. To patch a carpet we replace the damaged area with a new piece of carpet. 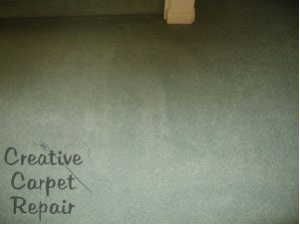 When a skilled person patches a carpet it’s normally but not always completely invisible. The new carpet is has a slightly different color than the original carpet due to fading. Your new carpet patch has a different wear pattern than the rest of the carpet. There’s a gap between the seams of the carpet patch. There may be an overlap at the seams of the carpet patch. Some of the carpet nap may have been cut off. Some of the carpet nap may have been glued down into the seam. The top layer is called the carpet nap or the carpet pile. 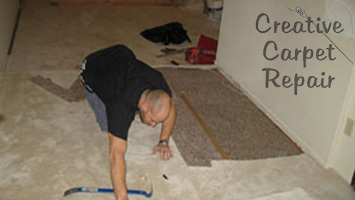 Carpet pile needs to be considered when doing any kind of carpet repair. The shorter the nap, the more likely it is that you will see the seams. The next layer below the carpet nap is the backing. Most carpet comes with two layers of backing. 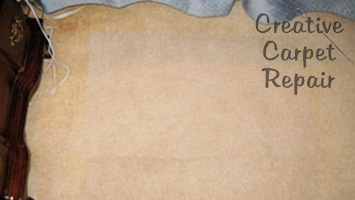 The nap and layers of backing are normally all held together with a very strong adhesive. 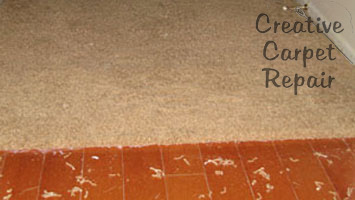 Under the carpet backing is your carpet pad. 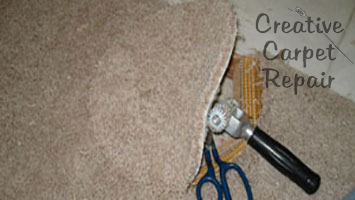 Some carpet repairs can be localized to just the top layer. 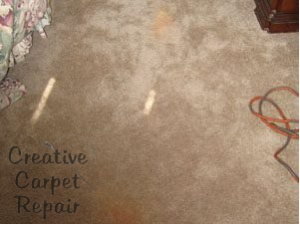 Sometimes in the case of a minor carpet burn we will just remove the top layer of carpet while leaving the backing in place. 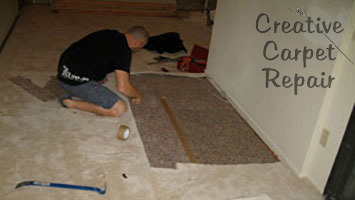 The next best place to find a suitable piece of carpet to do your carpet patch is in a closet. 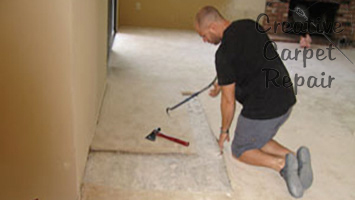 Often we will remove a piece of carpet from a closet to do the patch with and replace the closet carpet with something that the customer found at a carpet store. 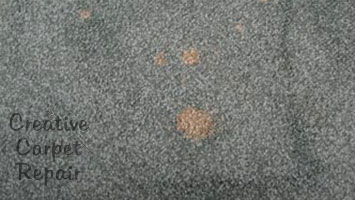 Very often the customer thinks that they can find an exact match at the carpet store. The chances of finding a match are not good. Even if you do find something that is supposed to be the same exact carpet, it’s likely that the dye lot will have changed ever so slightly. 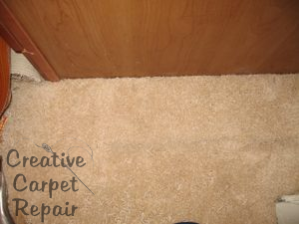 If the stairway or hallway carpet has worn out but all the other carpet in the house still looks good, you may want to pull the carpet out of one bedroom to use to replace the worn out areas. 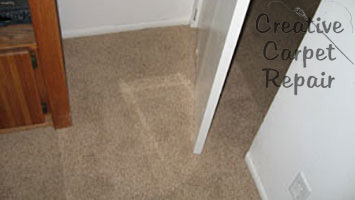 By using this strategy you can save a lot of money because now you only need to buy new carpet for one room. The carpet in the hallway or the carpet on the stairs will still match the carpet in the living room. 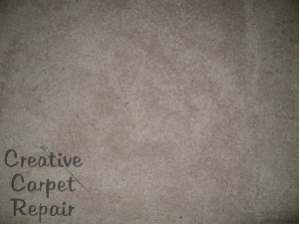 How to patch carpet: An oversimplified step – by – step tutorial… By the way, don’t do this if you want it to look great. Start by taking out the bad carpet. You can use a straight edge, a row finder and a slotted blade knife. Some people use an ice pick or a Phillips screwdriver instead of the row finder. Put the straight edge on the carpet with the groove side laying face down. When you use the row finder to separate the nap, be gentle. Gingerly drag the tip of the row finder against the side of the straight edge so that you can cut the backing without cutting the nap. Remember this, any nap you cut will be a place that you can see the seam. Always use a brand new blade. The biggest mistake people make is to try to save a nickel by using a blade too long. I will often change the blade a couple of time when cutting one patch. If you are feeling any resistance, change the darn blade! Have your new piece of carpet in front of you. Position your body directly on top of the area you will be cutting. Discover which way the nap is running by brushing the carpet with your hand in all the different directions. I can’t understate the importance of getting the carpet patch to run the same direction as the rest of the carpet. Some carpet is easy to figure out because it will lay flat as you brush your hand across it in one direction and stand up as you brush your hand in the opposite direction. Just keep at it until you figure it out and don’t move on to the next step until you’re sure you have it right. You’ll want to cut the patch to perfection from the backing. Turn the carpet patch upside down and use the slotted blade knife against the side of the straight edge to cut the patch just right. If you haven’t done this before then most likely you won’t be able to cut the carpet patch to fix exactly right. 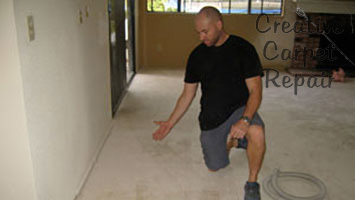 This is the step that you really need to weigh the cost of hiring a professional carpet installer. If you do it yourself then you may not be as satisfied with the results. After you’ve cut the patch of carpet and you are satisfied that it’s going to fit just perfectly and the carpet nap is running the proper direction you’ll want to seal the edges. We use latex to seal the edges of the carpet and the carpet patch but it’s perfectly acceptable to use the glue gun. Just be careful to use a very thin layer so that it doesn’t ruin the nice clean edge that you just cut. Finally you’re ready to attach the carpet patch. You can use either a carpet seam iron or a glue gun. There’s a new seam iron available called the Kool Glide as well. If you’re a beginner you’d be best off using the glue gun. Take your time! Plug it in now so that it’s nice and hot when you’re ready to use it. Measure the seam tape so that it is a bit longer than every seam of the patch. 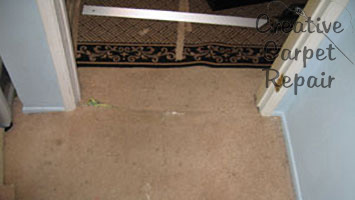 Place the seam tape lengthwise, half under the patch and half under the surrounding carpet. Put the patch where it belongs with the carpet seam tape under the seam. Slowly begin to glue the two sides of the seams to the seam tape and to each other. 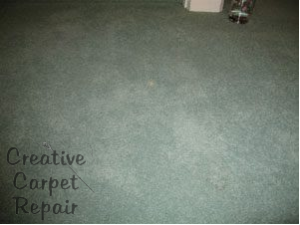 Use a generous amount of glue but not so much that it oozes up through the carpet. (Suggestion. Keep a glass of water beside you at all times in case you get hot glue on your fingers. If you do, quickly dip your fingers into the water. Remember that you are gluing the backing down to the seam tape. Keep the nap out of the way. If you’ve never done this before then it’s a good idea to have someone help you. Four hands are better than two. 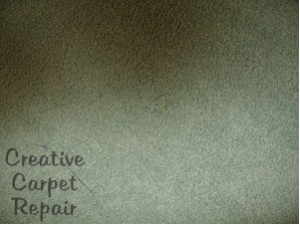 While you are gluing the carpet to the seam tape, press the carpet into the hot glue so that the glue seeps into the backing. Professionals use a carpet tractor for this but you can probably get away without it. As you finish a few inches at a time, place a flat heavy object on top of the seam. Professionals often use the tray of their toolbox. You can use something heavy like a cinder block. Wait a few minutes before you walk on it or get it wet.